The number of breast cancer assessment centres in Northern Ireland could be reduced to three from five. That means some people will have to travel further to be seen. But they should be assessed within the 14-day target set by the Department of Health. The department's proposal, which will go to public consultation for 12 weeks, follows concerns about a shortage of specialist staff which has led to longer than acceptable waiting times. 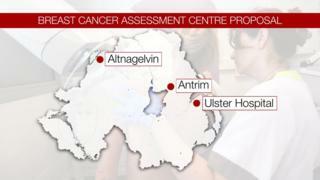 Under the plans, breast cancer assessment centres at Altnagelvin, Antrim and the Ulster hospitals will remain open. However, centres in Belfast's City Hospital and Craigavon will close. Health chiefs argue that removing assessment services from the City Hospital will enable staff to concentrate on patients attending for other cancer treatments. Permanent Secretary Richard Pengelly said consolidating care on just three sites was to the benefit of both patients and staff. "We have listened carefully to patients' voices and it is very clear that timely access to care is the overriding priority," he said. "The way breast assessment services are currently delivered is becoming increasingly fragile. "Staffing challenges are an important factor behind these pressures and demand for care including urgent referrals for suspected cancer is increasing." Dervilia Kernaghan of Cancer Focus NI said it would be welcome news for a lot of cancer patients. "While we do understand that with the changes some women will have to travel for appointments, overall we think women will be waiting a lot less time to see and receive expert help," she said. "The hope is with the new system, they will be seen more quickly." Sharon Stafford, who was diagnosed with breast cancer two years ago, told BBC News NI that waiting for a diagnosis was the worst part. "I would travel to the end of the world to be assessed as quickly as possible," she said. "Really, the north of Ireland isn't a very big place, so there's not really that much travelling to be done." Joanne Nordmann, who has also fought cancer, said while location should not really matter for assessment, it is important that people are treated as close to home as possible. "There are lots of appointments even before treatment starts, so having that close at hand is good, it is necessary," she said. "You need people around you, especially for those who have chemotherapy. That is hard. "Sometimes you are going back several times a week, so public transport can also be essential as you can't drive. "Location of treatment is important as you can't add to the anxiety and stress that women are already feeling." Heather Monteverde, head of services for Macmillan in Northern Ireland, also welcomed the announcement. "By concentrating resources in fewer sites, women will be seen much quicker," Ms Monteverde said. "Those who don't have a cancer diagnosis will get the reassurance they need and those who do will start treatment sooner and get the necessary support and care." A review of breast surgery in Northern Ireland is under way and a report is due by the end of the year. Last November, BBC NI reported that only 11.9% of urgent breast cancer referrals were seen within 14 days in the Northern Health and Social Care Trust during September. In February, the BBC reported that less than a quarter of urgent breast cancer referrals in the Southern Health Trust last October were seen within 14 days. Under the new proposals, there could also be a centralised booking system. People would be able to book online and could choose to travel a greater distance in order to get an earlier appointment.